For the original Human Torch, see Human Torch (android). Created by writer Stan Lee and artist Jack Kirby, Johnny Storm is a renovation of Carl Burgos's original character, the android Human Torch, created for Timely Comics in 1939. Storm first appeared in The Fantastic Four #1 (cover-dated Nov. 1961), establishing him as a member of the titular superhero team. In his plot summary for this first issue, Lee passed on to Kirby that the recently formed Comics Code Authority had told him that the Human Torch was only permitted to burn objects, never people. Over the course of the series, Johnny being the little brother of teammate Susan Storm a.k.a. the Invisible Girl was one of several sources of tension within the group. Additionally, he starred in a solo feature in Strange Tales #101-134 (Oct. 1962 – July 1965), an eight-issue series, The Human Torch (Sept. 1974 – Nov. 1975), reprinting stories from that solo feature, a 12-issue series, Human Torch (June 2003 - June 2004) by writer Karl Kesel and penciler Skottie Young, and the five-issue team-up miniseries Spider-Man / Human Torch (March–July 2005) by writer Dan Slott and penciler Ty Templeton. The Human Torch was originally the permanent co-star of Marvel Team-Up, but was dropped after three issues because the creators found this format too restrictive. He co-starred in two one-shot comics, Spider-Man & the Human Torch in... Bahia De Los Muertos! #1 (May 2009), by writer Tom Beland and artist Juan Doe, and Incredible Hulk & the Human Torch: From the Marvel Vault #1, a previously unpublished story from 1984, originally intended for Marvel Team-Up by plotter Jack C. Harris, scriptwriter and artist Kesel, and breakdown artist Steve Ditko. Growing up in Glenville, New York, a fictional Long Island suburban town, Johnny Storm lost his mother due to a car accident from which his father, surgeon Franklin Storm, escaped unharmed. Franklin Storm spiraled into alcoholism and financial ruin, and was imprisoned after killing a loan shark in self-defense. Johnny Storm was then raised by his older sister, Sue Storm. A panel from The Fantastic Four #1 (Nov. 1961) (left) shows the Human Torch as drawn in his first adventure. 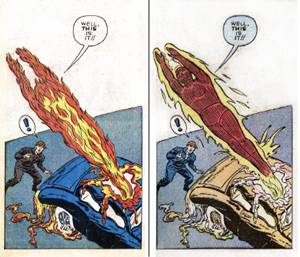 The depiction was altered when the story was reprinted in Fantastic Four Annual #1 (1963) (right), to conform to how the Human Torch was depicted from The Fantastic Four #3 onward. Original pencil art by Jack Kirby and unconfirmed inker. Alterations by Sol Brodsky. At 16, Storm joined his sister and her fiancé, Reed Richards, in a space flight in which cosmic radiation transformed those three and spacecraft pilot Ben Grimm into superpowered beings who would become the celebrated superhero team the Fantastic Four. Storm, with the ability to become a flaming human with the power of flight and the ability to project fire, dubs himself the Human Torch, in tribute to the World War II-era hero of that name. In The Fantastic Four #4, it is Storm who discovers an amnesiac hobo whom he helps regain his memory as the antihero Namor the Sub-Mariner, one of the three most popular heroes of Marvel Comics' 1940s forerunner, Timely Comics, returning him to modern continuity. Though a member of a world-famous team, Storm still lived primarily in Glenville and attended Glenville High School. Here he thought he maintained a secret identity, although his fellow townsfolk were well aware of his being a member of the Fantastic Four and simply humored him. This series introduced what would become the recurring Fantastic Four foes the Wizard and Paste-Pot Pete, later known as the Trapster. In Storm's home life, Mike Snow, a member of the high-school wrestling squad, bullied Storm until an accidental flare-up of the Torch's powers scarred Snow's face. Storm dated fellow student Dorrie Evans, although she eventually grew tired of his constant disappearances and broke off their relationship. The Human Torch adopted a red and gold costume in Fantastic Four #132-159, in emulation of the Golden Age Human Torch. Panel from Fantastic Four #132 (March 1973). Art by John Buscema and Joe Sinnott. After graduating high school, Storm enrolled at New York City's Metro College. There he befriended his roommate Wyatt Wingfoot. He also met the original Human Torch of the 1930s and 1940s. Around this time, Storm met and fell in love with Crystal, a member of the superpowered race the Inhumans. After their relationship ended, Crystal returned to her native city of Attilan and eventually married the superhero Quicksilver, Storm, crushed, attempted to move on, finding that his high-school girlfriend, Dorrie Evans, had married and had two children..[volume & issue needed] Storm dropped out of college but remained friends with Wingfoot, who often participated in the Fantastic Four's adventures. Storm eventually began a romance with who he thought was Alicia Masters but was eventually revealed to be an alien from the shapeshifting Skrull race, Lyja, posing as Masters. In the interim, they married. Storm later discovers "Alicia's" true identity, and that Lyja is pregnant with his child. He then witnessed Lyja's apparent death and rescued the real Alicia from the Skrulls. Seeking an acting career, Storm was cast as the Old West hero the Rawhide Kid, but producers reconsidered and gave the role to Lon Zelig (actually the alien Super-Skrull). After working mostly in some television shows, Storm also spent some time as a firefighter at the behest of his former classmate, Mike Snow,[volume & issue needed] but when Snow moved away after his wife turned out to be a psychopathic arsonist and seemingly died, Storm left the job. He later returned to the profession during a period when the Fantastic Four was short on cash. [volume & issue needed] Frustrated with her brother's directionless life and near-disastrous pranksterism, his sister compelled him to become chief financial officer for the Fantastic Four, Inc. Infighting and betrayal resulted in a near-catastrophe, ending Storm's position. After a major battle with the supervillain and dictator Doctor Doom, Fantastic Four leader Reed Richards attempted to claim Doom's Latveria for the Fantastic Four, an act that alienated the United States government and his own team. This led to team-member Ben Grimm's apparent death and the Fantastic Four's subsequent dispersal. Storm took to fixing cars for a living. Grimm later was revealed to be alive. Over the Internet, Storm meets a young woman, Cole, whom he learns is the daughter of one of the Fantastic Four's oldest enemies, the Wizard; after a confrontation with that supervillain, who escaped with Cole, Storm remained hopeful of meeting her again. For a time, Storm became the Herald of the powerful cosmic being Galactus, becoming the Invisible Boy after switching powers with his sister and teammate, Susan Richards, the Invisible Woman. During the 2006–2007 "Civil War" company-wide crossover, in which the superpowered community is split over the Superhuman Registration Act, which required them to register with, and become agents of, the US government, Storm and his sister allied with the underground rebels, the Secret Avengers. Shortly afterward, during the "Secret Invasion" company-wide crossover, the shape-shifting extraterrestrial Skrulls intensified their clandestine infiltration of Earth. Storm was briefly reunited with his former Skrull girlfriend, Lyja. Though part of the invading force, she finds she still has some feelings for him, and does not carry out her mission of sabotage. She returns to her people, unsure of herself and of any future relationship. In the conclusion of the 2011 "Three" storyline, in Fantastic Four #587 (March 2011), the Human Torch appears to die fighting a horde of aliens from the otherdimensional Negative Zone. The series ended with the following issue, #588, and relaunched in March 2011 as simply FF. Spider-Man, one of Storm's friends, took his place on the team, as requested in the Torch's will. It is later revealed that the Human Torch was revived by a species of insect-like creatures that were implanted in his body by Annihilus in an attempt to force Storm to help open the Negative Zone portal. Storm eventually escapes, and Richards determines Storm was on the other side of the portal for two years from his perspective. In 2015, Human Torch joins Steve Rogers's Avengers Unity Squad and helps Rogue in incinerating the telepathic portions of Professor Xavier's brains. He becomes a multi-billionaire when he inherits Reed Richards' and Sue Storms' wealth and uses the money for rebuilding the Avengers Mansion and philanthropy. He is seemingly annihilated when he grabs a cosmic object called Pyramoids during the fight between the Lethal Legion and the Black Order in Peru, but is restored after Living Lightning wins a high stakes poker game versus the Grandmaster. To help Thing cope with Mister Fantastic and Invisible Woman's disappearance, Human Torch takes him on a journey through the Multiverse using the Multisect in order to find them. They have not been able to find Mister Fantastic and Invisible Woman as they return to Earth-616 empty-handed. Human Torch and Thing were reunited with Mister Fantastic and Invisible Woman to help fight the Griever at the End of All Things after Mister Fantastic persuaded the Griever to let him summon Human Torch and Thing. The Human Torch has been involved in several romantic relationships throughout the years, including, but not limited to, the Inhuman Crystal, member-in-training and future Galactus herald Frankie Raye, the Skrull agent Lyja disguised as Alicia Masters, the Atlantean Namorita, Inhuman Medusa, and X-Men member Rogue. Torch's brief relationship with Namorita lasted until he pursued a career in Hollywood. [volume & issue needed] It is suggested that he had a short relationship with his Uncanny Avengers/Unity Squad leader Rogue, following which he had a rebound relationship with Medusa (Crystal's sister). He and Rogue seem to have resumed their relationship, which is considered as an open secret. However this relationship came to an end after his apparent death and when Rogue rekindled her relationship with Gambit. He has also had relationships with civilian women. Johnny Storm gained a number of superhuman powers as a result of the mutagenic effects of the cosmic radiation he was exposed to, all of which are related to fire. His primary ability to envelop his body in fiery plasma without harm to himself, in which form he is able to fly by providing thrust behind himself with his own flame, and to generate powerful streams and/or balls of flame. He can also manipulate his flame in such a way as to shape it into rings and other forms. Even when not engulfed in flame himself, Storm has the ability to control any fire within his immediate range of vision, causing it to increase or decrease in intensity or to move in a pattern directed by his thoughts. Additionally, he is able to absorb fire/plasma into his body with no detrimental effects. The plasma field immediately surrounding his body is hot enough to vaporize projectiles that approach him, including bullets. He does not generally extend this flame-aura beyond a few inches from his skin, so as not to ignite nearby objects. Storm refers to his maximum flame output as his "nova flame", which he can release omnidirectionally. Flame of any temperature lower than this cannot burn or harm the Torch. This "nova" effect can occur spontaneously when he absorbs an excessive amount of heat, although he can momentarily suppress the release when necessary, with considerable effort. Storm has demonstrated enough control with fire that he can safely shave another's hair, or hold a person while in his flame form without his passenger feeling discomforting heat. His knowledge extends to general information about fire as well, supported by regular visits to fire-safety lectures at various firehouses in New York. In one instance when poisoned, Storm superheated his blood to burn the toxin out. Storm's ability to ignite himself is limited by the quantity of oxygen in his environment, and his personal flame has been extinguished by sufficient quantities of water, flame retardant foam, and vacuum environments. He can reignite instantly once oxygen is returned, with no ill effects. In early stories he could only remain aflame for up to five minutes at a time, after which he would need five minutes to recharge before igniting himself again. Storm was depicted as transmuting his body itself into living flame in the first two issues of The Fantastic Four. In all subsequent appearances, his power consists in the generation of a flaming aura. The Human Torch was a regular character in the 1967 Fantastic Four animated series, voiced by Jack Flounders. The Human Torch did not appear in the 1978 Fantastic Four animated series and was replaced with a robot called H.E.R.B.I.E.. The television rights to the Human Torch had been separately licensed, although never actually used, for a television pilot movie by Universal Studios and this prevented the use of the Torch in the series. For the same reason, the Human Torch was supposed to be one of the main characters on Spider-Man and His Amazing Friends, but Firestar was created in his place. The Human Torch appears in the 1994–95 Fantastic Four animated TV series., voiced by Brian Austin Green in the first season and by Quinton Flynn in the second season. The Human Torch and the rest of the Fantastic Four appeared in the Secret Wars episodes of the mid-1990s Spider-Man animated series voiced again by Quinton Flynn. The Human Torch appears in the 2006 Fantastic Four animated TV series, voiced by Christopher Jacot. The Human Torch appears in the animated TV series The Avengers: Earth's Mightiest Heroes, voiced by David Kaufman. The Human Torch appears in the Hulk and the Agents of S.M.A.S.H. episode "Monsters No More", voiced by James Arnold Taylor. The Human Torch/Johnny Storm is played by Chris Evans in the big budget 2005 movie Fantastic Four. In the film, he is an intelligent, but arrogant, young man in his early twenties who loves extreme sports. He is the younger brother of Susan Storm, who works within Von Doom Industries as Victor von Doom's chief of the Science Department. Chris Evans reprises his role as Johnny Storm in Fantastic Four: Rise of the Silver Surfer. When his older sister's wedding is interrupted by the Silver Surfer, Johnny pursues the Surfer and loses the subsequent confrontation. Due to his contact with the Surfer, Johnny is thereafter able to switch powers with any of his teammates through physical contact. This change thwarts their attempt to trap the Silver Surfer when he accidentally switches powers with Reed. However, when Doom steals the Surfer's board and powers, Johnny uses his change to absorb the powers of the entire team, using Sue's invisibility and his own flame powers to sneak up on Doom before overpowering him with the Thing's strength and Reed's elasticity. He loses the ability to switch powers when he makes contact with the Surfer for a second time. Simon Rex portrayed the Human Torch in the spoof film Superhero Movie (2008). Michael B. Jordan portrayed Johnny Storm in the 2015 film Fantastic Four. While Johnny Storm is still the son of Franklin Storm, Susan Storm is his adoptive sister. He gains his powers following a visit to Planet Zero. Since the incident, the scientists working with Franklin Storm designed a special suit that helped Johnny to master his powers. After Victor von Doom returned from Planet Zero and was making his way back to the Quantum Gate to further his goals, Johnny was devastated when Victor killed Franklin Storm. Johnny later helped Reed, Susan, and Ben fight Victor. The Human Torch featured prominently in the 2000 Spider-Man video game, voiced by Daran Norris. The Torch makes numerous appearances in cut-scenes throughout the game. At the end of the game, he is seen dancing with the Black Cat. 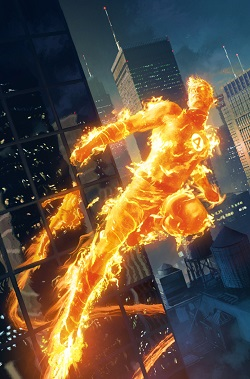 The Human Torch is a playable character in the Fantastic Four video game based on the 2005 movie, voiced by Chris Evans with his classic version reprised by Quinton Flynn in bonus levels. The Ultimate Marvel version of the Human Torch appeared in the 2005 Ultimate Spider-Man game, voiced by David Kaufman. The player, as Spider-Man, had to race the Torch through New York. The Human Torch appears in the 2007 Fantastic Four: Rise of the Silver Surfer video game, voiced by Michael Broderick. The Human Torch also appeared as a playable character in the Electronic Arts-produced title Marvel Nemesis: Rise of the Imperfects, voiced by Kirby Morrow. The Human Torch appears as a playable character in Marvel: Ultimate Alliance, voiced by Josh Keaton. His classic, Ultimate, original, and modern costumes are available. A simulation disk has Human Torch fighting Paibok. He has special dialogue with Black Widow, Hank Pym, Thing, Crystal, Uatu, Karnak, Wyatt Wingfoot, Black Bolt, and Shocker. The Human Torch is a playable character in Marvel Super Hero Squad Online, voiced by Antony Del Rio. The Human Torch is available as downloadable content for the game LittleBigPlanet, as part of "Marvel Costume Kit 2". The Human Torch appeared in the virtual pinball game Fantastic Four for Pinball FX 2 released by Zen Studios. The Human Torch is a playable character in the mobile game Marvel: Future Fight. The Human Torch is a playable character in the Facebook game Marvel: Avengers Alliance. The Human Torch appears as a playable character in the 2012 fighting game Marvel Avengers: Battle for Earth, voiced by Roger Craig Smith. Human Torch is a playable character in the MMORPG Marvel Heroes, voiced by Matthew Yang King. However, due to legal reasons, he was removed from the game on July 1, 2017. Human Torch appears as a playable character in Lego Marvel Super Heroes, voiced again by Roger Craig Smith. The Human Torch is a playable character in the mobile game Marvel Puzzle Quest. In 1975, Bill Murray played Johnny Storm in a daily radio adaptation of the early issues of Fantastic Four. The show lasted for 13 weeks. Human Torch appeared as an 8-inch action figure in Mego's World's Greatest Super Heroes toy line in the 1970s. Human Torch has appeared in the Marvel Legends toy line, in series 2, in the three version of the Fantastic Four box set (the ordinary, variant and the Wal-Mart special). Though it is a different character, the Inhuman Torch (Kristoff Vernard) appeared in the House of M box set. The Human Torch is the eighteenth figurine in The Classic Marvel Figurine Collection. The Human Torch was ranked as the 90th greatest comic book character by Wizard magazine. IGN ranked the Human Torch as the 46th greatest comic book hero, stating that even though the youngest member of the Fantastic Four routinely basked in the glory of his celebrity status, he also proved himself in his many adventures with both the Fantastic Four and Spider-Man. ^ Batchelor, Bob (2017). Stan Lee: The Man Behind Marvel. Rowman & Littlefield. pp. 73–74. ISBN 9781442277816. ^ Batchelor, Bob (2017). Stan Lee: The Man Behind Marvel. Rowman & Littlefield. p. xiii. ISBN 9781442277816. ^ Strange Tales at the Grand Comics Database. ^ The Human Torch, Marvel, 1974 series at the Grand Comics Database. ^ Human Torch, Marvel, 2003 series at the Grand Comics Database. ^ Spider-Man / Human Torch at the Grand Comics Database. ^ Miller, Jonathan (October 2010). "Spider-Man and Company: The Wide World of Marvel Team-Up". Back Issue!. Raleigh, North Carolina: TwoMorrows Publishing (44): 33–39. ^ Spider-Man & the Human Torch in... Bahia De Los Muertos!' at the Grand Comics Database. ^ Incredible Hulk & the Human Torch: From the Marvel Vault #1 at the Grand Comics Database. ^ Fantastic Four #32 - "Death of a Hero"
^ Fantastic Four Annual #1 at the Grand Comics Database. ^ "Dearly Beloved", by Roger Stern, John Buscema, and Sal Buscema. Fantastic Four #300 (March 1987). ^ Ching, Alber (January 25, 2011). "Associated Press Spoils 'Fantastic Four' #587 Hours Before Comic Goes on Sale". Newsarama.com. Archived from the original on May 28, 2013. ^ Moore, Matt. "After Half Century, It's 1 Fantastic's Farewell", Associated Press via ABC News, January 25, 2011. WebCitation archive. ^ Khouri, Andy (9 February 2011). "Fantastic Four Get a New Name, New Costume and an Old Spider-Man". ComicsAlliance.com. Archived from the original on 28 May 2013. ^ Hanks, Henry (February 11, 2011). "Spider-Man replacing Human Torch on new 'FF' team". CNN. ^ Avengers #0 (October 2015). ^ Marvel Two-In-One Vol. 2 #1-8. Marvel Comics. ^ Fantastic Four Vol. 6 #1. Marvel Comics. ^ "X-POSITION: Duggan Readies Rogue for Big Moments in "Uncanny Avengers"". CBR. Retrieved 22 May 2018. ^ Lee, Stan (w), Kirby, Jack (p), Brodsky, Sol (i), Goldberg, Stan (col), Simek, Artie (let), Lee, Stan (ed). "Chapter 2 Enter the Sub-Mariner!" Fantastic Four 4 (May 1962), New York, NY: Canam Publishers Sales Corp.
^ Lee, Stan (2014). Epic Collection: Fantastic Four: The World's Greatest Comic Magazine. Mavel Comics. p. 440. ISBN 978-0-7851-8832-2. ^ Schedeen, Jesse (April 28, 2014). "Ranking the Spider-Man Animated Series". IGN. Retrieved April 29, 2014. ^ "Marvel Super Hero Squad Voice Cast". Comics Continuum. 28 July 2009. Retrieved 2011-04-12. ^ "Monsters No More". Hulk and the Agents of S.M.A.S.H. Season 1. Episode 24. June 29, 2014. Disney XD. ^ Fleming, Michael "Fox sets 'Fantastic' reboot", Variety, August 31, 2009. ^ Kit, Boris. "Fox Chooses 'Fantastic Four' Reboot Stars". ^ "Fantastic Four Pinball". Marvel.com. Archived from the original on 2013-10-17. Retrieved 2014-02-18. ^ "Human Torch joins Marvel Heroes". Marvel Heroes. 2012-07-11. Archived from the original on 2012-12-17. Retrieved 2012-07-19. ^ Parsons, Arthur (April 18, 2013). "HULK Smash!!!!". LEGO. Retrieved April 12, 2013. ^ Monaco, Steve (2005-01-13). "Bill Murray as . . . The Human Torch? - Minneapolis / St. Paul News - Steve Monaco - Couch Pundit". Blogs.citypages.com. Archived from the original on 2010-10-14. Retrieved 2011-04-12. ^ "Wizard's top 200 characters". Wizard. republished at Herochat.com, 18 May 2008. Archived from the original on 8 June 2011. Retrieved May 19, 2011. ^ "Human Torch is number 46". IGN. Retrieved May 19, 2011.